Hartford Stage’s presentation of Twelfth Night, directed by Darko Tresnjak, is so sumptuous, so pleasing to look at and so cleverly staged that it’s possible our appetite for any other setting for William Shakespeare’s classic might be slaked. Before we even begin the tale of Viola (Kate MacCluggage who starred in Hartford Stage’s Bell Book and Candle), shipwrecked and believing that her twin brother, Sebastian (Joe Paulik) has been lost at sea when she assumes the role of Cesario, a male servant to Duke Orsino (Lea Coco), we’re mesmerized by the setting of Illyria: a circular, green foliage-covered, English hedge maze, bordered by shrubs and a colorful backdrop designed by Alexander Dodge. Viola emerges water-soaked from the depths of the hedge. Orsino, languishing in his bath tub, rises up out of the center of the maze, as does a wooden globe. Both double later respectively as a putting green and a prison. The object of Orsino’s affection, Olivia (Stacey Yen), and her ladies in waiting (Hartt students Celina Lopez, Katherine Schenker and Arielle Solomon who probably most appreciate the quote “O, had I but followed the arts…”) gracefully leap over wooden bridges linking the tops of the rings of the maze while Malvolio (Bruce Turk), walks below in the trenches offering up a hand to help his mistress. The ensemble is attired in costumes that evoke a 1920s theme while also giving a sense of the flowing gowns and formal attire from the Elizabethan period when the play first would have been performed. Equally at home here are sword fighters Cesario and Sir Andrew Aguecheek (an amusing Andrew Green), the fool, Jeste (Che Avende, who performs some of non-era specific original music composed by Sound Designers David Budries and Nathan A. Roberts), sporting a Harlequin clown outfit with black and white diamonds and red accent and Olivia in her flowing flapper-esque gown. Costumer Designer Linda Cho marks her 40th collaboration with Tresnjak on this production. Craig Handel choreographs the fight. To borrow from the play’s most famous quote, Tresnjak’s greatness (he was artistic director of the Old Globe Shakespeare Festival in San Diego before taking the helm at Hartford Stage) is thrust upon the ensemble resulting in some standout performances for minor characters in addition to the featured turns by Green and Turk (who, as one of the most brooding Malvolios ever, does a really memorable bit trying to force a smile): Miles Spencer-Davis as drunken Sir Toby Belch; Jennifer Reagan as Olivia’s plotting maid, Maria; and another Hartt student, Josh Boscarino, as Valentine and a priest. Loved the conspirators hiding down in the hedge with heads (and drink glasses) popping in and out as Malvolio walks into their trap. While the staging is great, this version lacks some chemistry between the players, however. 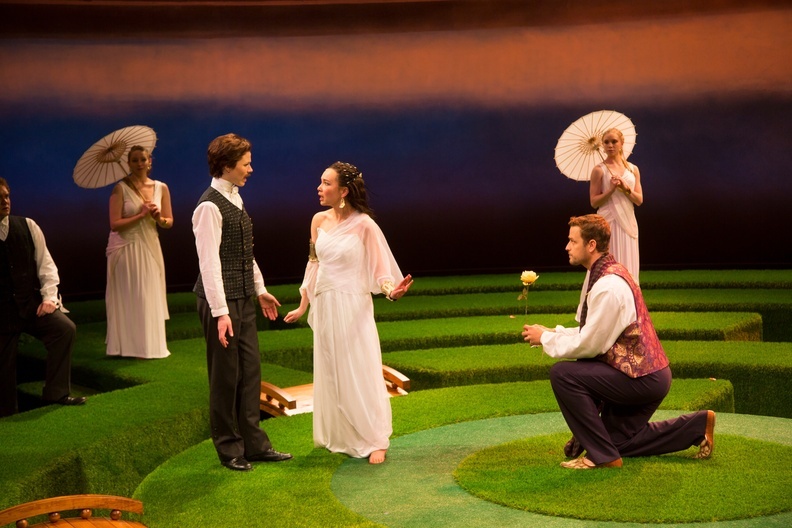 We’re not convinced about Viola’s love for Orsino (or his growing, unnerving attraction to Cesario, the page he believes to be a man), the underlying sparks between Maria and Toby or that Olivia is excited to find herself married to Sebastian rather than Cesario. Mistaken identity, plots for revenge and love combine for a romantic comedy that is music to look at, though. Let it play on and on. Well, until June 16 at least. That will be the last day you can catch Twelfth Night at Hartford Stage, 50 Church St., Hartford. Performances: Tuesday, Wednesday, Thursday and Saturday at 7:30 pm; Friday and Saturday at 8 pm; Matinees Sunday and select Wednesdays and Saturdays at 2 pm. Tickets $26.50-$93.50 with discounts for groups and students (show recommended for 12 and up). (860) 527-5151; www.hartfordstage.org.